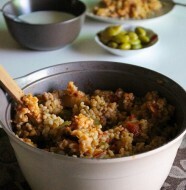 For some time now I have been wanting to post a recipe for a dish which from the Gaza region because I’ve never posted any in the blog before. So I decided to contact my friend for her recommendation of the most popular Gazan dishes, and of which she nominated three, Rummaneyye, Summaqeyye, and Duqqa. It was strange enough that I haven’t tried any of them. 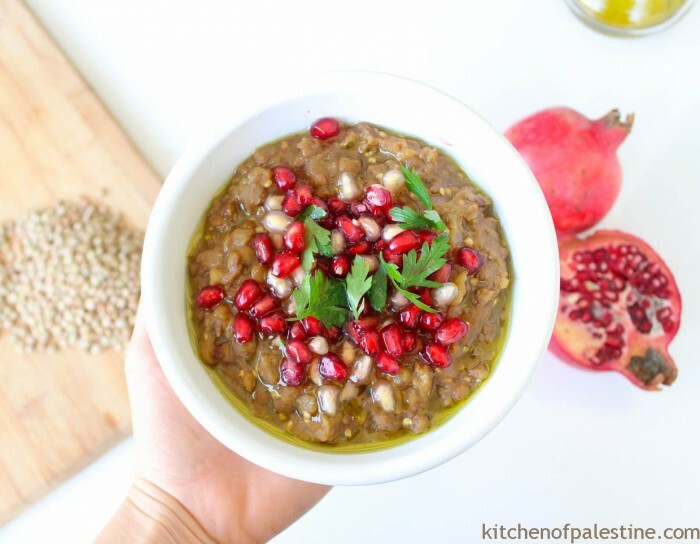 Since we are already in pomegranate season, Rummaneyye (which means pomegranate-ish) was the obvious choice, I was already familiar with the name but was pleasantly surprised to learn that besides the pomegranate being the main ingredient, the dish also consists of eggplant, lentils and garlic. Pretty interesting combination that you won’t imagine how would it tastes until you try it. 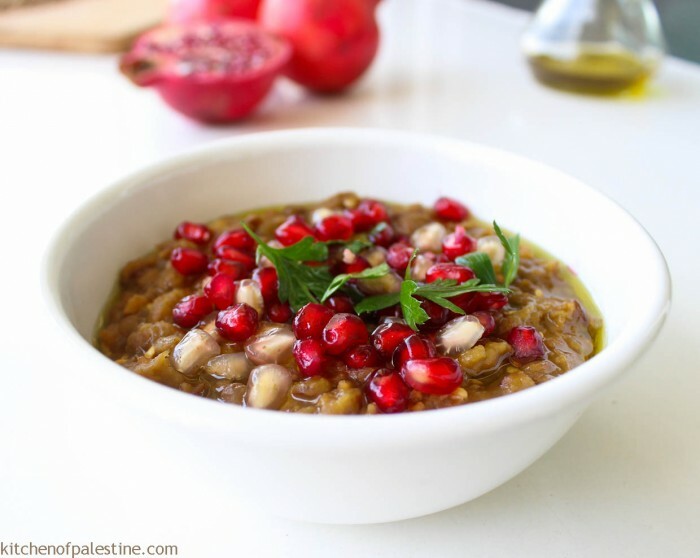 After some further research though, I learned that Rummaneyye is not originally a Gazan dish, but is in fact a dish that was brought to Gaza by natives of Lud and Jaffa who had been displaced following the events of 1948. In a medium-size pot, add rinsed lentils and stir for a minute. Add 2 to 3 cups of water (make sure it's completely covered), cover the pot and leave it over low heat for about 15 minutes until half-cooked. Add eggplant cubes, salt, black pepper, and cumin. Stir and leave for another 10 to 15 minutes until lentils and eggplants are tender and totally cooked. Meanwhile, bring olive oil to medium heat in a different frying pan. Add garlic, coriander, and flour and keep frequent stirring until garlic become golden brown. Add the garlic mix to the lentil and eggplant pot, and then the pomegranate juice (or molasses). 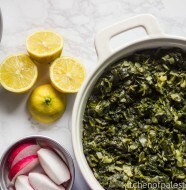 Stir the pot for 3 to 5 minutes so all ingredients are cooked together. Pour the mixture in middle-sized deep plates. 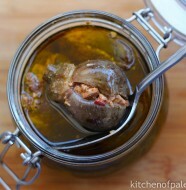 Add seasoning of olive oil, red chili pepper, and garnish with parsley and grains of pomegranate. Serve hot or cold with pita or taboun bread as per your preference. Nicely photographed! I see a trend. Thank you Brian.. I see a trend as well. Maybe it’s time for a change. Beautiful Eman!!! I want to make it asap. You see hoe the lights sorts out everything! I took your advice to the next level. Photo-shoot was in the early morning in the balcony.. Thanks Lara! Wow! Eman this looks so good. I can’t wait to try it. Thank you for your comment.. Great to make to contact with you as well, and I will check out cansurviving! Thank you for this recipe! I tried it today and it was fantastic. Will be trying some of your other recipes in the coming weeks. Thank you Eman for the perfect Rommaniyah recipe. The sweet and sour mix along with the creamed eggplants is divine for the pallet. But I am sorry, Rommaniyah is from Gaza not Al lud or Yaffa. And will be happy to provid you with historical evidence offline. PS. I tried it with freshly squeezed pomegranate and added couple of table spoons of debis romman (concentrated pomegranate juice). The fresh squeezed juicy gave it a sense of freshness & lightness. I made this for a party of Middle Eastern food. It was simple but very rich in it’s taste. Thanks!